Hi,'data_2' is a cell containing 'date' in the first column and 'time' in the second column. Whenever there is an object detected under a time stamp, the identity of the object along with the error is added to the next row. (This data is from video recordings of toy cars). What i want to do is to add the frame number corresponding to each time stamp. In the sample code shown, i am adding the frame number to the first column. I wrote a sample code to perform this. When i perform this, the increasing frame number is added for detections under a single time stamp. Eg: If you look at 'row 5' there are two detections and the identities are added to the rows 6 and 7. These both are detected at same time. But there frame number is not the same. It should be the same as of the time stamp, ie '5'. Any help to solve this will be appreciated. Where does this data come from? It's not very difficult to obtain the results you want, but perhaps it's even easier to fix this issue already in the data import. I agree with Jonas, it is probably better to fix the import if possible. Finally, I would recommed against converting numbers to char arrays or strings. Keep them as numbers, it's easier to work with and is faster. Now you have one row for each frame with every object stored in the 3rd column. Hi, i tried this code. This works for me. But i want the data to be ordered in a different way. I am attaching the actual text file from where the data is taken from. 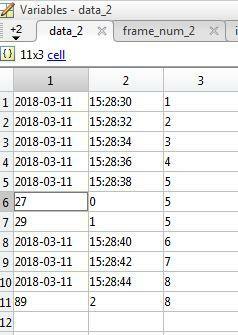 Can you help me to do the operation in such a way so that the increasing frame number is added in an entire column, without making the detections under a time stamp to be in a cell? An image of the final cell which i would like to have is attached. Did you remove the file again? I can't find anything. I added an image as shown above. This is how the actual text file looks like this. ...I still feel mixing dates and numbers in the same column is a bit inconvenient.